Editor: While the people of the U.S. are blindly involved in national elections, NO candidate offers a platform that would withdraw U.S. troops and U.S. economic blockades and pressure from virtually every country across the globe. Now Venezuela, Brazil, and the rest of Latin America are under the gun. 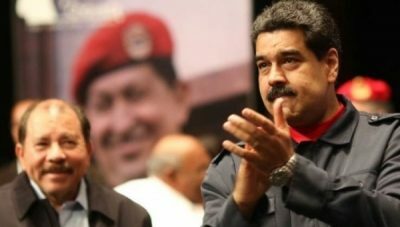 Venezuelan President Nicolas Maduro declared a 60-day state of emergency on Friday due to what he called plots from within the OPEC country and the United States to topple his leftist government. Maduro did not provide details of the measure. A previous state of emergency, implemented in states near the Colombian border last year, suspended constitutional guarantees in those areas, except for guarantees relating to human rights. 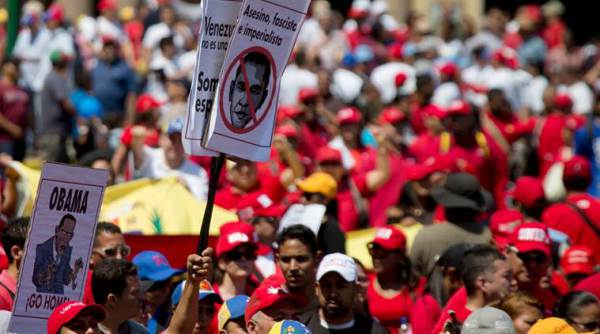 Protest against U.S. intervention in Venezuela Sat. May 14, 2016. Sign calls U.S. Pres. Obama an assassin, fascist, and imperialist. Venezuela’s opposition is seeking to recall the unpopular leader, 53, amid a worsening crisis that includes food and medicine shortages, frequent power cuts, sporadic looting and galloping inflation. 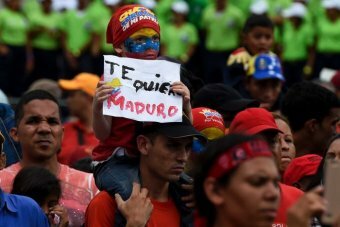 Protester’s sign says: I want Maduro. But the former union leader and bus driver has vowed to stick out his term, and accuses the United States of fomenting an undercover coup against him. He pointed to this week’s impeachment of fellow leftist Dilma Rousseff in Brazil as a sign that he is next. “Washington is activating measures at the request of Venezuela’s fascist right, who are emboldened by the coup in Brazil,” Maduro said during a Friday night broadcast on state television. Washington has had an acrimonious relationship with Caracas for years, especially following U.S. support for a short-lived 2002 coup against late leader Hugo Chavez. Pres. Maduro during celebration of Pres. Hugo Chavez’s revolutionary history. Venezuela’s ruling Socialist Party has long been a strong ally of Rousseff’s Workers Party, however, and her departure adds to Maduro’s isolation in Latin America. Flanked by his ministers and a statue of Chavez, Maduro signed a state of emergency and extend a state of economic emergency to protect the country from foreign and domestic “threats,” without providing details. Venezuela’s opposition, which scoffs at Maduro’s accusations of coups-mongering, quickly condemned the measure. Brazil’s President Dilma Rousseff has condemned the move to impeach her as a “coup” and a “farce”, denying she has committed any crimes. She was addressing the nation on TV for the first time since senators voted overnight to suspend her for budgetary violations and put her on trial. Ms Rousseff vowed to fight the “injustice” by all legal means. Vice-President Michel Temer will assume the presidency while Ms Rousseff’s trial takes place. Pres. 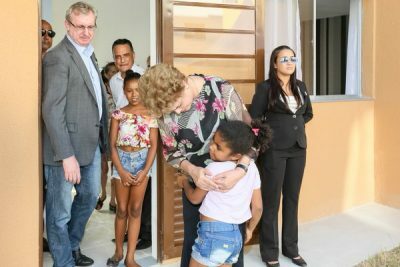 Dilma Roussef celebrates opening of new workers housing. The trial may last up to 180 days, which would mean Ms Rousseff would be suspended during the Olympic Games in Rio de Janeiro, which start on 5 August. Ms. Rousseff is accused of illegally manipulating finances to hide a growing public deficit ahead of her re-election in 2014. Protest supports Pres. Roussef as she leaves on suspension. Branding the process “fraudulent” and saying her government was “undergoing sabotage”, she vowed to fight the charges against her and said she was confident she would be found innocent. Michel Temer became interim president as soon as Ms Rousseff was suspended. The 75-year-old law professor of Lebanese origin was Ms. Rousseff’s vice-president and was a key figure in the recent upheaval. Michel Temer’s new cabinet is composed of all-white males for the first time in decades. 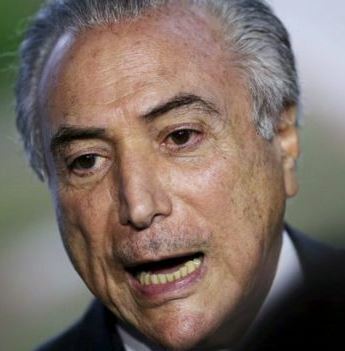 He is president of Brazil’s largest party, the PMDB, which abandoned the coalition in March. 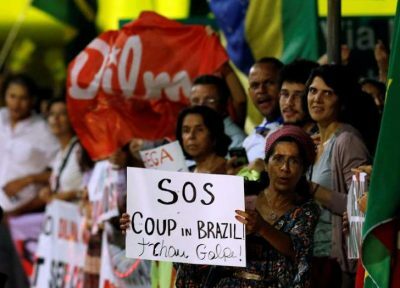 In recent months, his role has become even more influential; in a WhatsApp recording leaked in April, he outlined how Brazil needed a “government to save the country”. Ms Rousseff, 68, accused the opposition of leading the impeachment because they had vehemently opposed all the advances she and her predecessor, Luiz Inacio Lula da Silva, had made for the Brazilian poor and lower middle classes. After her speech she left the presidential palace and shook hands with supporters lining the pathway. In another speech outside she told supporters she could feel their “love and energy” on what she called a “tragic” day for the country. 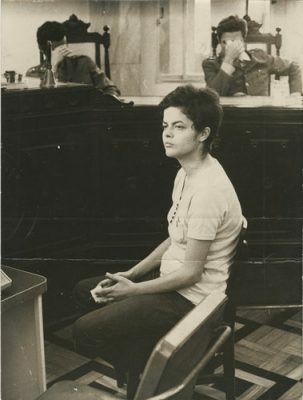 Dilma Roussef, age 22, during military hearing. She was tortured by the government then, but said her ouster this time is worse than that torture. Michel Temer is set to be sworn in later on Thursday and he is expected to give a speech and present some of his cabinet. During the overnight debate, Senator Jose Serra, tipped to become the new foreign minister, said the process was “a bitter though necessary medicine”. “Having the Rousseff government continue would be a bigger tragedy,” he said. Brazil is suffering from its worst recession in 10 years, unemployment reached 9% in 2015 and inflation is at a 12-year high. The 180 days allocated for the trial to take place expire on 8 November. This entry was posted in Uncategorized and tagged ENDGENOCIDE, EndUSIMFeconomicwars, MaduroSI, ReparationsforCARICOM, RoussefSIM, StopUSWarsAbroad, USHandsoffBrazil, USHandsoffVenezuela. Bookmark the permalink. I am from Vancouver, Canada and I wanted to say that the Yankees are behind the Coup in Brazil and they support the right wing opposition in Venezuela which is the source of the problems in Venezuela. Michel Temer is part of the problem in Brazil and Dilma Rousseff should be allowed to continue as President. President Maduro is doing the right thing in calling a state of emergency and getting the troops ready to battle the Yankee supported Opposition.The Opposition needs to be crushed so that the Bolivarian Revolution can continue to help the people of Venezuela. The Bolivarian Revolution also has greatly helped the rest of Latin America and the Caribbean.The Yankees are a problem in all of Latin America and they needs to get out of Latin America.The gains of the Bolivarian Revolution needs to be advanced by whatever means necessary.Lon live the Bolivarian Revolution. This is all a ploy, soon south america will be back to how it was in the 1950’s dependent on the establishment countries of europe to give them handouts, instead of being their own independent countries taking care of themselves. South America will soon turn into Africa, if Venezuela falls. Other Socialist South American countries might see this and go “oh that can’t happen to my country”, BUT IT WILL. The U.S. doesn’t stop at anything, all the major oil companies will be there in venezuela if it falls, mark my words. To leave it at that, I’m glad that Maduro has learned from what happened in Libya, so that he may be more prepared than Gaddafi who foolishly thought the west wouldn’t be so vicious. Maduro knows where the opposition army will come from, and its near colombia. The president of colombia, juan santos called for a U.S. intervention. A libya-like invasion. You see, even the media is preparing for this to happen, they are running propaganda campaigns for the opposition, so people can feel “empathy” for those nincompoops. And lets not forget and act like it hasn’t already happened, when Rouseff was suspended by idiots who have no idea who will replace her, the new guy has an all white male cabinet, in a country where they are the minority. Its 1950’s all over again. I find it very frightening and frustrating how much short term memory people have, do they not do research and think about the repercussions before taking action? Long Live the Socialist Bolivarian Revolution.